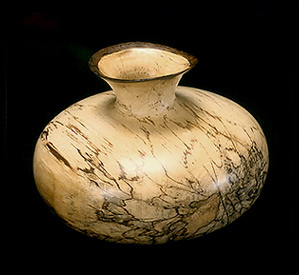 This beautifully lathe-turned hollow-vessel was made from a section of a silver maple tree log given to me by a friend in West Virginia. The end-grain of the log showed slight speckles of grey and black- a sign that "spalting", a naturally occurring fungus that can discolor the wood in sometimes-beautiful designs, had begun. To enhance the continuation of this spalted pattern, I allowed it to "brew" by keeping the log buried outdoors in wet sawdust for more than a year. 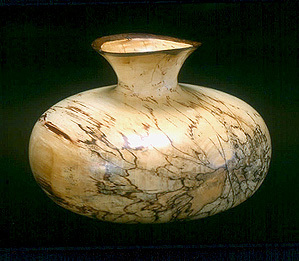 As I turned this piece, I used the shape of the vase to emphasize the fluidity of the pattern, as the spalting became more pronounced near the exposed ends of the log and the center of the log. Working from the outside edge inward I was able to save the bark edge at the top of the piece while creating a very light weight vessel.